This article is about the scientific term. For other uses, see Toxicity (disambiguation). Toxicity is the degree to which a substance can damage an organism. Toxicity can refer to the effect on a whole organism, such as an animal, bacterium, or plant, as well as the effect on a substructure of the organism, such as a cell (cytotoxicity) or an organ such as the liver (hepatotoxicity). By extension, the word may be metaphorically used to describe toxic effects on larger and more complex groups, such as the family unit or society at large. Sometimes the word is more or less synonymous with poisoning in everyday usage. A central concept of toxicology is that the effects of a toxin are dose-dependent; even water can lead to water intoxication when taken in too high a dose, whereas for even a very toxic substance such as snake venom there is a dose below which there is no detectable toxic effect. Toxicity is species-specific, making cross-species analysis problematic. Newer paradigms and metrics are evolving to bypass animal testing, while maintaining the concept of toxicity endpoints. For substances to be regulated and handled appropriately they must be properly classified and labelled. Classification is determined by approved testing measures or calculations and have determined cut-off levels set by governments and scientists (for example, no-observed-adverse-effect levels, threshold limit values, and tolerable daily intake levels). 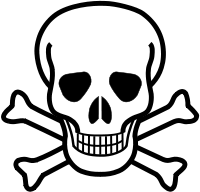 Pesticides provide the example of well-established toxicity class systems and toxicity labels. While currently many countries have different regulations regarding the types of tests, amounts of tests and cut-off levels, the implementation of the Globally Harmonized System has begun unifying these countries. Environmental hazards tend to focus on degradability, bioaccumulation and aquatic toxicity. 20th century printmakers and other artists began to be aware of the toxic substances, toxic techniques, and toxic fumes in glues, painting mediums, pigments, and solvents, many of which in their labelling gave no indication of their toxicity. An example was the use of xylol for cleaning silk screens. Painters began to notice the dangers of breathing painting mediums and thinners such as turpentine. Aware of toxins in studios and workshops, in 1998 printmaker Keith Howard published Non-Toxic Intaglio Printmaking which detailed twelve innovative Intaglio (printmaking)-type printmaking techniques including photo etching, digital imaging, acrylic-resist hand-etching methods, and introducing a new method of non-toxic lithography. 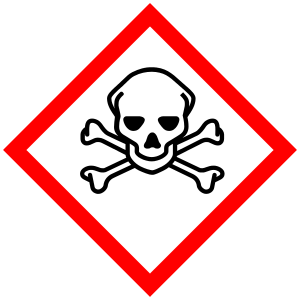 Toxicity of a substance can be affected by many different factors, such as the pathway of administration (whether the toxin is applied to the skin, ingested, inhaled, injected), the time of exposure (a brief encounter or long term), the number of exposures (a single dose or multiple doses over time), the physical form of the toxin (solid, liquid, gas), the genetic makeup of an individual, an individual's overall health, and many others. Several of the terms used to describe these factors have been included here. Continuous exposure to a toxin over an extended period of time, often measured in months or years; it can cause irreversible side effects. ↑ "Toxicity Endpoints & Tests". AltTox.org. Retrieved 25 February 2012. ↑ Matsumura Y, Ananthaswamy HN (March 2004). "Toxic effects of ultraviolet radiation on the skin". Toxicology and Applied Pharmacology. 195: 298–308. doi:10.1016/j.taap.2003.08.019. PMID 15020192.